Not too long ago, I had a mosaic binding pass through my hands. It was all I could do to let go of it. 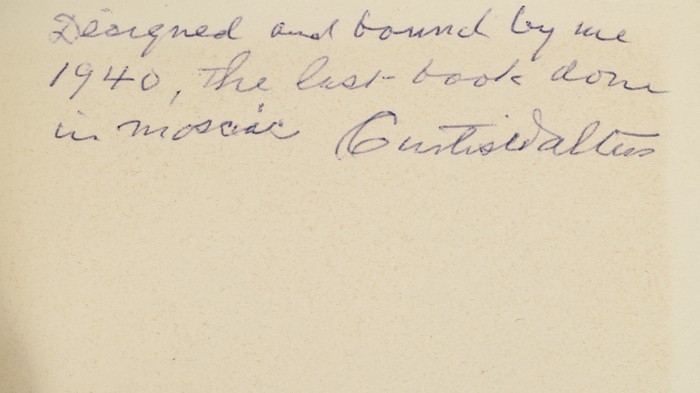 The book was bound by the great American binder, Curtis Walters. The front cover possesed a design of intersecting elliptical inlays in bright orange with small gilt circles against a background of curved compartments in grey and black. 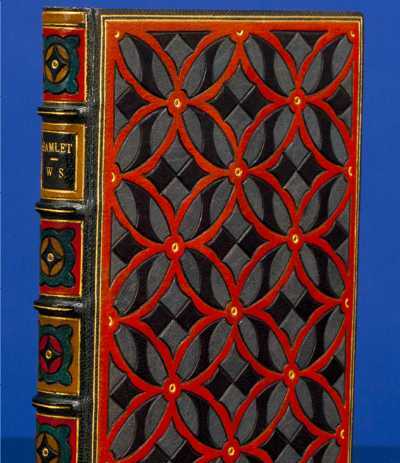 The design was reproduced on the back cover but with tan intersecting elliptical inlays with small gilt circles against a background of black and red curved compartments. Both covers had two-line gilt borders. 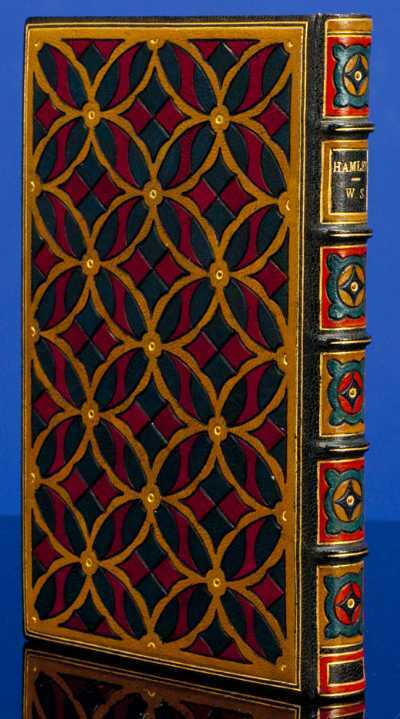 The spine was graced with five raised bands with gilt lines and similar Mosaic inlays in tan, dark-green, red and black framed in gilt, each with a small gilt center circle. Red morocco doublures triple-ruled in gilt with a border of green morocco.splashed the inside covers. The front doublure had a six-piece symmetrical pattern inlaid in black morocco and blue watered-silk end-leaves were a final touch. The binding was stamp-signed in gilt on the rear doublure "Bound by C. Walters." This was the last Mosaic binding executed by the artist. 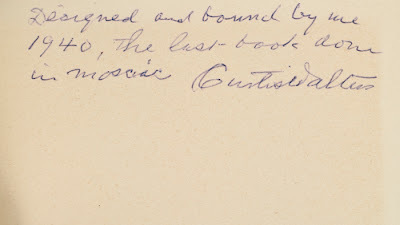 The front flyleaf bears the following inscription in purple ink: "Designed and bound by me / 1940, the last book done / in Mosaic. Curtis Walters"
"Mr. Walters was influenced to take up bookbinding around 1900 by the late George D. Smith, eminent bookseller. Later he studied with Matthews, the Club Bindery and Stikeman. He conceived his ideas about mosaic bindings as early as 1904, but between 1907 and 1928 he remained inactive. He has invented and brought to perfection a new technique whereby the most intricate inlaid designs can be achieved by a few simple tools, without the use of dies or punches; gilt dots, circlets and fillets are generally applied with restraint. "Although the three bindings illustrated show some characteristic patterns evolved by Mr. Walters, they cannot even nearly convey an idea of the color effects achieved by the artist; these can only be appreciated by looking at the bindings themselves. Mr. Walters’ work has received wide recognition. Some of his early bindings are included in the Henry W. Poor collection, and almost all of those offered for sale here have been exhibited in Paris (1930), New York (Columbia University, 1935), Hamburg (Kunstgewerbeschule, 1933-36) and Berlin (1936). "Articles describing and illustrating these masterpieces have appeared in several journals such as the Archiv für Buchbinderei (1934), Das deutsche Buchbinerhandwerk (1939) and The American Book Collector (1932). It need hardly be added that all of Mr. Walters’ bindings are made of the very finest leathers available, and that their workmanship reveals consummate craftsman down to the smallest detail" (From the catalog Foreword, Parke-Bernet sale, Tuesday, December 10th, 1957, whence these, alas, black and white photos are found). 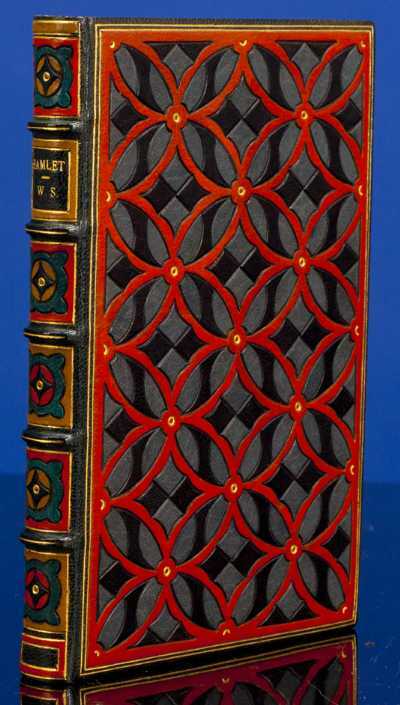 My colleague, Thomas G. Boss of Salem, Massachusetts, a fine bindings specialist with a particular interest and expertise in American bookbinders, reports that many of Walters' mosaic bindings are an absolute riot of colors. He tells me that Walters' mosaic binding for the copy of Keats' Poems seen above is positively "psychedelic" in effect. For those to whom fine bindings are a mind-altering drug, the mosaic bindings of Curtis Walters will blow your mind. [MOSAIC BINDING]. WALTERS, Curtis, Binder; SHAKESPEARE, William; GILL, Eric, illustrator. The Tragedy of Hamlet, Prince of Denmark. With Engravings by Eric Gill and an Introduction by Gilbert Murray. London: The Limited Editions Club, 1933. Limited to 1,500 copies (of which this is number 1267) signed in pencil by Eric Gill. Color images courtesy of David Brass Rare Books, with our thanks. Black and whites images from Parke-Bernet auction catalog Tuesday December 10th, 1957.